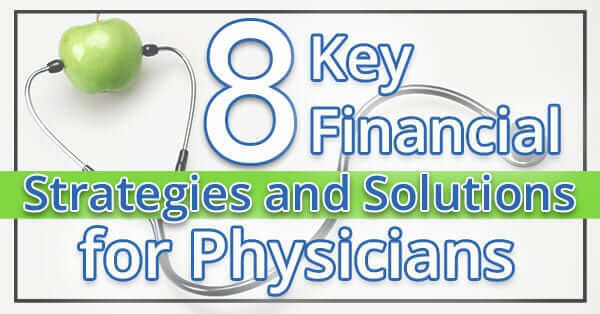 As a physician, you’ll probably be dealing with more complicated finances than most people. Tackling those numbers won’t be an easy feat. You may even want to avoid the subject of physicians finance altogether. Out of sight, out of mind. No sweat, no stress– dust your hands off and walk away. Don’t do it! Ignoring your problems won’t bring any solutions; all it does it make them bigger and bigger. The first step to managing your income and debt is forming a plan. You need a financial blueprint that will support you through med school, residency, and practice. You may have opened a line of credit to borrow the funds necessary to reach residency. You may also have drawn up a detailed budget, with potential costs weighed against potential income. For that matter, you might have already paid down some of your debt–or all of it. It would take strict adherence to a sound budget, but it isn’t impossible. Plenty of up-and-coming physicians get ahead of the curve during residency. But no matter where you are in your debt, income, and overall career trajectory, you need a plan. It’s never too early, and it’s never too late. Checking out our Physician Mortgage Loans might be something you want to look into as well. No two people are exactly alike, physicians included. Even physicians in the same field will face different factors. Tailor your plan to your unique background and goals. There’s no one-size-fits-all template. • You’ll need to consider your net worth, cash flow, debt, taxes, and retirement plan. • The risks and requirements of your professional field will call for specific kinds of insurance. • You may have to invest in costly equipment–and maintain it as well. • You’ll have to differentiate between assets that increase in value and those that depreciate. • You should even start thinking about your estate–what you’ll own and what you’ll owe when you pass away. • Don’t forget to make provisions for the future of your family in the event of a tragedy. Minor children especially deserve consideration in all your plans. And that’s just brushing the surface of the many factors that go into a sound financial strategy. The sooner you get started on it, the better. One of the most common causes of failure in any plan is unrealistic standards. You fall short, get discouraged, and rather than adjusting the program, throw it all out. Avoid this pitfall by keeping your goals realistic. From what you’ll accomplish to when you achieve it, it’s better to underestimate than the opposite. If you make it farther than you’d expected, you only risk being pleasantly surprised. Don’t think of it as pessimism; think of it as a realistic view of your future. Look around at what others are achieving and what they’ve already achieved. Get a feel for what’s practical in your field. If you can, talk to people who’ve been down the same road before and ask them for their input. They’ll have a better idea of where you should aim to be in five, ten, or twenty years. It’s not enough to have a plan. It has to be front and center. Don’t draw up a budget and then stuff it away to collect dust in a filing cabinet. Review it at regular intervals to make sure you’re keeping on course. If changing factors make your old plan outdated, you can tweak it or even rework it completely. Your plan shouldn’t be a dead document hidden away. It should be alive and kicking, informing your daily decisions. Saving more than you spend is no one’s favorite bit of financial advice. After all, why pursue such a potentially lucrative career if you don’t get to enjoy the rewards? There is very much a tomorrow, and another after that, and you should be preparing for them all. Saving is going to be very important to you. Physicians usually must cover more of their retirement income through personal savings than most people. Social Security replaces less pay for affluent workers. And if you own your practice, you won’t have an employer to match retirement plan contributions. You’ll probably want to accumulate ten times your final annual pay before considering retirement. For example, if your total annual compensation is $200,000, you should have at least $2 million saved up before you call it quits. That’s going to take some financial discipline, yes. But in the end, you’ll reap the ample rewards in peace of mind and comfortable retirement. This may seem like a contradiction of the previous section. Both tips go hand in hand. Making wise investments gets your money working for you. You should put money in the bank to save it. But if you also invest some funds, not only will you have them later, you’ll have some extra. Of course, investing is no easy game. You may want to do your research, then play it safe. On the other hand, you could get help from a professional who understands the market a little better. Even on your own, you don’t have to throw money blindly and hope for the best. You can take the time to study and hone your knowledge through practical experience. Still, there’s a reason so many people hire experts for added surety and increased rewards. There could be any number of reasons why you like going it alone at times. But there’s wisdom in a multitude of counselors. The best way to travel the sometimes-treacherous path of your industry is to listen to those who’ve gone before. Even your peers may offer a fresh perspective and bits of advice you wouldn’t have thought of on your own. You’re not alone out there. Talk to people. Ask questions. Reach out, and it’s a safe bet you’ll be better off for it. You may strengthen existing relationships or begin new ones–relationships that will be a significant help throughout your career. Then, someday, when a younger up-and-comer wants your sage advice, you can pass the favor. As a physician, you’re going to be busy a lot of the time. Even from the start, you may want to think about delegating what you can, especially as it relates to your finances. Hiring professionals to assist you isn’t cheating. You wouldn’t be lazy. You’d be smart. Reaching out to experts will let you focus on what’s most important to you. Your career, your family, and your well-being are worth protecting, even if it means getting a little help. Accountants, financial advisors, and tax planners are standing by to help you walk a sure path to a better life. But maybe you don’t like that idea. Perhaps you’d rather save the money and do it yourself. Remember: time is money, and every minute you save yourself is cash in the bank. Not to mention the value of avoiding the stress and preoccupation that come with trying to juggle too much. It’s usually best for people to seek professional medical help rather than trying to treat themselves, right? In the same way, it’s often wisest to go to someone who’s dedicated their professional life to financial expertise. What you save in time, energy, and cold, hard dollars will more than compensate you for anything you spend. A career as a physician means a significant income to support yourself or a family. It means helping people who need help and making the world a better place. It means bigger and better things than you may realize now, no matter your career stage. Don’t worry! If one person made it to this promised land, so can you. Plenty more will come after you. With both eyes open and some solid backup helping you out, your finances don’t have to be a nightmare. In fact, they can be a dream. Just by reading this article, you’ve already taken an excellent first step. Now it’s time to take the next. We’re rooting for you all the way.